Happy Monday Everyone! I hope you had a wonderful weekend. 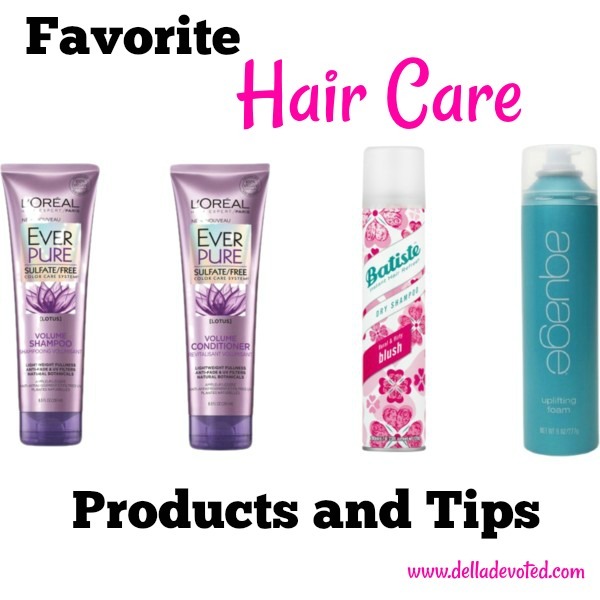 Today I'm sharing my favorite hair care tips and products with you. I'm also linking up with my wonderful friends from The Blended Blog, so don't forget to stop by and say hello to them. My favorite hair products are listed with links below. From time to time, I like to switch up my shampoo and conditioners. These two below are my second favorites that I use when I switch up. If you can't already tell from products above, I use volumizing products. I have very fine and oily hair so volumizing products are a must. Even though I have oily hair, I do not wash my hair everyday. Washing your hair everyday is really hard on your hair, especially for thin hair like mine. I try to wash it every 3-4 days. I have found that the Aquage Uplifting foam has really helped with volume and the more volume I have, the less I have to wash my hair. When my hair lays flat on my head it tends to get oily quickly. I also use dry shampoo when my hair is getting oily on the last day before washing again. Dry Shampoo is also great for adding back volume to limp hair. I also sleep with my hair up in a loose bun. Laying on my hair at night makes it flat and oily. I have also found that if I curl my hair instead of straightening it, I have more volume and my hair doesn't get oily nearly as fast. Last but not least, I only have my hair colored or highlighted about 3 times a year. My awesome hair stylist Ginger does peekaboo highlights and doesn't color the part of my hair so that the regrowth is not nearly as bad. I am due for new highlights and color but my hair still looks fresh from when I had it done back in the fall. It hasn't faded and you can't even tell that I have regrowth. Ginger really is awesome! My hair has grown so much and has gotten so much healthier since I've been going to her these last two years. I would love to hear from you! What are your favorite hair products and tips?